Northwest’s Jaclyn Burchett rounds third after hitting her first of two home runs Tuesday evening in the Mohawks’ 12-9 loss to Adena. Northwest’s Haley Hawes slides safely into second base during the Mohawks’ 12-9 loss to Adena Tuesday evening. FRANKFORT — Jaclyn Burchett hit two home runs, Addi Newman pitched a decent game in the circle, and Northwest pounded out 14 hits and played solid defense. But some nights just aren’t your nights. 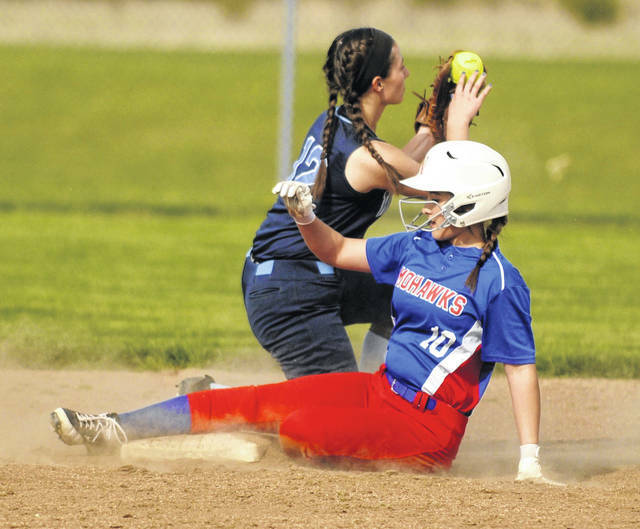 Traveling to Frankfort Adena Tuesday night for a non-league bout, the Mohawks (4-10) fell to the Warriors (4-7) by a 12-9 final … a game in which they led at one point 7-3. But still, it’s easy to see Northwest is playing better — the program handed Eastern a 9-8 loss this past weekend before topping West by a 9-0 final on Monday. The Mohawks scored first as Burchett hit her first home run, a towering shot over the left field fence to give her team a 3-0 lead in the top of the second inning. That lead swelled to 4-0 before the Warriors answered with three runs of their own in the bottom half, making it 4-3. Northwest scored two more in the third, thanks in part to an RBI single from Burchett, before getting another in the fourth, seizing a 7-3 lead heading to the bottom half of the inning. But Adena had seen enough. A two-run bomb via Liv Sheppard and a two-run double from Makaela Lovely helped the Warriors score six runs to take a 9-7 lead into the fifth. That’s when Burchett struck again with a solo shot, almost identical to her first homer, helping the Mohawks force a 9-9 tie. 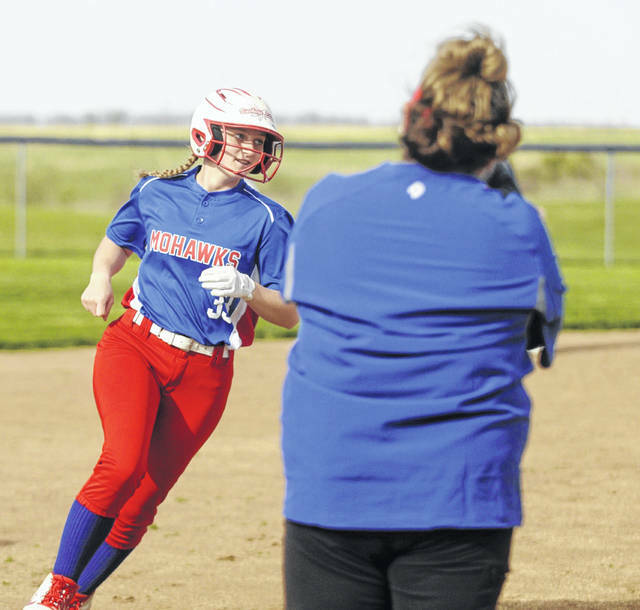 However, in the bottom of the sixth, Adena scored three runs — keyed by a two-run home run from Jade Johnson — to put away the Mohawks for good. Johnson was 1-for-3 with the home run and four RBIs, Sheppard was 2-for-3 with a homer and two RBIs, Chey Ater finished 2-for-3 with a double and a run, and Makayla Baxted ended the day 3-for-3 with two runs and two RBIs. For Northwest, Burchett finished the night 3-for-3 with two homers and five RBIs, Haley Hawes was 3-for-5, Laiken Rice went 1-for-4 with two runs and a walk, and Addi Newman was 2-for-3 with an RBI and a run. Newman took the loss in the circle, throwing three innings, allowing eight hits and walking three. Northwest gets right back to it Wednesday evening as they travel to West for the second contest of the two’s two-game SOC II series.